Saturn’s Enceladus –“Does It Have a Deep Biosphere? "The reaction between the metallic rocks and the ocean water produces molecular hydrogen (H2) provides a source of chemical energy that is essential for supporting a deep biosphere in the absence of sunlight inside moons and planets," said Christopher Glein of the Carnegie Institute. "This process is central to the emerging science of astrobiology, because molecular hydrogen can both drive the formation of organic compounds like amino acids that may lead to the origin of life, and serve as food for microbial life such as methane-producing organisms. As such, serpentinization provides a link between geological processes and biological processes. The discovery of serpentinization makes Enceladus an even more promising candidate for a separate genesis of life." New research led by Glein has revealed the pH of water spewing from a geyser-like plume on Saturn's moon Enceladus. Their findings are an important step toward determining whether life could exist, or could have previously existed, on the sixth planet's sixth-largest moon. 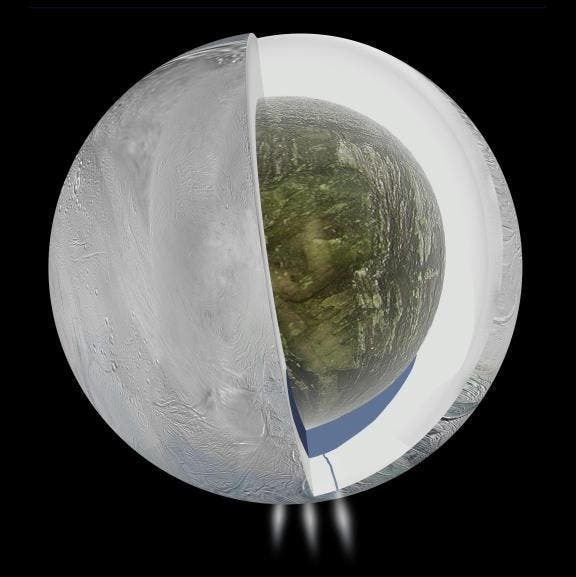 The diagram below illustrates the possible interior of Saturn's moon Enceladus, including the ocean and plumes in the south polar region, was based on Cassini spacecraft observations, courtesy of NASA/JPL-Caltech. Enceladus is geologically active and thought to have a liquid water ocean beneath its icy surface. The hidden ocean is the presumed source of the plume of water vapor and ice that the Cassini spacecraft has observed venting from the moon's south polar region. Whenever there's the possibility of liquid water on another planetary body, scientists begin to ask whether or not it could support life. The present team, including lead author Glein, John Baross of the University of Washington, and J. Hunter Waite Jr. of the Southwest Research Institute, developed a new chemical model based on mass spectrometry data of ice grains and gases in Enceladus' plume gathered by Cassini, in order to determine the pH of Enceladus' ocean. The pH tells us how acidic or basic the water is. It is a fundamental parameter to understanding geochemical processes occurring inside the moon that are considered important in determining Enceladus' potential for acquiring and hosting life. Their work is published in the journal Geochimica et Cosmochimica Acta. The team's model, constrained by observational data from two Cassini teams, including one led by coauthor Waite, shows that the plume, and by inference the ocean, is salty with an alkaline pH of about 11 or 12, which is similar to that of glass-cleaning solutions of ammonia. It contains the same sodium chloride (NaCl) salt as our oceans here on Earth. Its additional substantial sodium carbonate (Na2CO3) makes the ocean more similar to our planet's soda lakes such as Mono Lake in California or Lake Magadi in Kenya. The scientists refer to it as a "soda ocean." 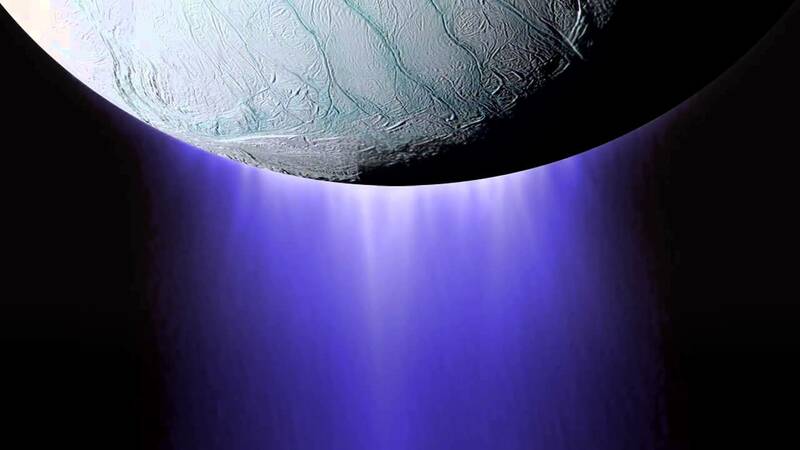 "Knowledge of the pH improves our understanding of geochemical processes in Enceladus' 'soda ocean,'" Glein explained. The model suggests that the ocean's high pH is caused by a metamorphic, underwater geochemical process called serpentinization. On Earth, serpentinization occurs when certain kinds of so-called "ultrabasic" or "ultramafic" rocks (low in silica and high in magnesium and iron) are brought up to the ocean floor from the upper mantle and chemically interact with the surrounding water molecules. Through this process, the ultrabasic rocks are converted into new minerals, including the mineral serpentine, after which the process is named, and the fluid becomes alkaline. On Enceladus, serpentinization would occur when ocean water circulates through a rocky core at the bottom of its ocean. Even beyond the search for life-hosting conditions on other planetary bodies, the team's work demonstrates that it is possible to determine the pH of an extraterrestrial ocean based on chemical data from a spacecraft flying through a plume. This may be a useful approach to searching for habitable conditions in other icy worlds, such as Jupiter's moon Europa. "Our results show that this kind of synergy between observations and modeling can tell us a great deal about the geochemical processes occurring on a faraway celestial object, thus opening the door to an exciting new era of chemical oceanography in the solar system and beyond." Glein added. This work was supported by the Deep Carbon Observatory, the Carnegie Institution for Science, the NASA Astrobiology Institute, and the Cassini Project. Saturn's Titan: "A Fascinating and Evolving World"